adapt and flourish when the trials of life throw them off track. Life is like cleaning the house—no matter how hard you work to clean up the mess, tomorrow the clutter and disorder will reappear, and it will just need cleaning again. In Making Sense When Life Doesn’t: The Secrets of Thriving in Tough Times(Summerside Press, April 2012, ISBN 978-1609362249, $14.99) best-selling author Cecil Murphey writes that while life’s messiness is unavoidable, it’s how a person chooses to respond to the mess that matters. None of us wants to be an expert on messes, but Murphey has walked through many hard times himself. In his career as a writer, pastor and missionary, he’s been a witness to what tragedy and change have done in the lives of countless others. Combined, these experiences allow him to share the secrets of thriving in tough times with wisdom and compassion. · I need the empty spaces in life to learn to accept fullness in life. · I need my opponents. They often speak the truth that my friends won’t. · To appreciate others’ accomplishments enables me to enjoy my own success. · We all have regrets about the things we’ve done. The biggest regrets are about the things we didn’t do. · It’s okay to feel sorry for yourself or get angry or depressed—that’s normal and natural. But don’t let those negative emotions control your life. · Changes will happen. I can accept them now, or I’ll be forced to accept them later. · We all have soft spots, and as long as they remain, we’ll automatically switch into a defensive mode to protect ourselves. An excerpt from Making Sense When Life Doesn’t by Cecil Murphey ©2012 Summerside Press. The title states the two ways I’ve heard the same question. We seem to think that if we’re good people, especially if we’re religious or spiritually minded, life will flow rather well for us, and we’ll encounter few hardships. Then, without warning, chaos lands on top of us. Or confusion. Or problems. Regardless of the term we use, we don’t like it, and we don’t understand. Asking either of the questions above comes out of our attempt to control life—and we need to get past that silly, futile idea. I need this mess, and I need this mess right now. Because I truly believe in a God who is sovereign, I also believe He knows what I need. I know what I want (or think I do), but I tend to opt for the easy, the quick, the expedient. Yet that’s not the way I mature as a person. I want to grow, yet I hate going through the messes of life. We’ve all heard “No pain, no gain.” It works the same way with life as it does with physical fitness. The messes in life are my best teachers. I don’t like them, but I need them. Learn more about Joanna Weaver and her books at www.JoannaWeaverBooks.com. Readers can also keep up with her via Facebook andTwitter. Wally Armstrong has believed in Jesus for a long time. He knew about having a relationship with Jesus, but didn’t know Him as a real companion and friend. One day, after Wally had a dramatic encounter on the golf course, his life was forever changed. In that moment, Wally realized that Jesus offered him the gift of friendship, up close and personal, that He shared with His disciples two thousand years ago. In PRACTICING THE PRESENCE OF JESUS, Wally offers a clear approach to experiencing that same dynamic relationship, and he shares simple steps for interacting with Jesus as if he were sitting right beside you. If you want an up and close friendship with Jesus, then PRACTICING THE PRESENCE OF JESUS could help transform you from the inside out. I was raised being taught how to pray without ceasing, and as a fiction writer, I have a lot of “imaginary friends” that I interact with when I write. Jesus is not an imaginary friend, He is very real, but I knew most of these principles shared in this book from the very beginning. He is someone I share everything with as if He were right beside me … and He is. But if this is something you long for, then do pick up PRACTICING THE PRESENCE OF JESUS and become friends with the savior. $12.99 hardcover. 128 pages. When is the last time you sat down and really talked to Jesus? This is a portion of a longer interview with Wally Armstrong. If you would like to see the full interview, let me know, and I’ll send it right to you! DESIGNED FOR DEVOTION is a 365-day journey from Genesis to Revelation. Since there is no better way to know God more intimately other than to immerse yourself totally in His Word, DESIGNED FOR DEVOTION is designed to do just that. It combines fascinating historical background information about the Bible with practical application you can implement in your life each day. This devotional will take you through the Bible from beginning to end. Key stories, characters, and basic teachings are highlighted. Old Testament passages that reveal Jesus as the Messiah are explored. There are historical information about each book of the Bible, including author, theme, and purpose. The Old and New Testaments are tied together to show the Bible as a single story. There is an application that will apply each day’s lesson to your own spiritual journey. I love getting devotionals to review, and DESIGNED FOR DEVOTION is a good one. It begins with a portion of scripture for you to read from the translation or version of your choice, then it talks about the story and flows seamlessly into the application. Then it closes with another verse for you. DESIGNED FOR DEVOTION is an excellent devotional book for yourself or for a friend. This would be a great gift for someone during the upcoming holiday season too. If you are looking for a new devotional then consider DESIGNED FOR DEVOTION. I enjoyed using it with my children when we had our family devotions. Recommended. $16.99. 384 pages. Detective Max Wellington is quick to respond to Bailey’s cries for assistance when more body parts start appearing. Bailey’s employee, Nate, starts tapping into company and home video surveillances. But will this be enough to stop another murder? And when the killers target Bailey, what is next? Will anyone be able to save her? 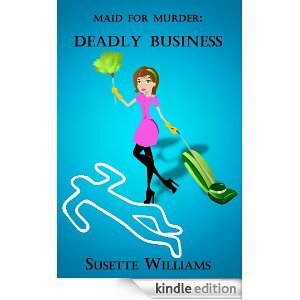 MAID FOR MURDER: Deadly Business is a totally cute cozy mystery. The reader can’t help but fall in love with Bailey and Max – and even Nate. And of course, Bailey just has a talent for finding trouble—or maybe trouble has a talent for finding her. Either way, the book is laugh out loud funny at times. Fans of cozy mysteries will love MAID FOR MURDER: Deadly Business and be asking for more cozy mysteries by this author. I hope Susette has more in the works. $4.99 (kindle only). Christmas—with no debt, less stress, and more joy! Are you feeling the pinch of Christmas? Watching your best friend rush out and buy all the latest and greatest in technology for her children and moaning because you haven’t got those kinds of funds? Still paying off last Christmas when you totally overspent, because your child needed a (fill in the blank) because all his friends had one? Well, it’s time to take Christmas in hand. Repeat after me. I am only going to pay cash for Christmas. Good. Say it again. Now, go put those credit cards in water and bury them in the freezer. No, I mean it. Cash only this Christmas. If you can’t afford it, don’t buy it. DEBT-PROOF YOUR CHRISTMAS is the latest book from Mary Hunt, a woman who went from over six figures credit card debt to writing books on how to manage your money. A woman who was just like you are and spent way more than she needed because those she loved had to have it. If you are wondering how to finance your Christmas – or perhaps have already blown it with the Black Friday sales, then DEBT-PROOF YOUR CHRISTMAS is a must-read. Those who are struggling to get out of debt, pay off student-loans, unexpected car bills, etc that waylaid your year need to read this book. And wondering how others do it? There are stories from other real life people who went cash only for Christmas. Like the woman who shares she only gives four items per person for Christmas. One homemade item, one item to wear, one to learn with, and one thing they wanted. Good advice. And may I suggest you can find brand new items cheap in your local thrift store—plus, the money you spend there goes to support some local ministry. DEBT-PROOF YOUR CHRISTMAS. Highly recommended. Recipes and other suggestions are included. $12.99. 240 pages. In case you missed it, here is the direct link to watch Mary Hunt’s interview on the Today Show (with Kathie Lee & Hoda) talking about Debt-Proof Your Christmas. What if all the bad things that happened to you . . . didn’t? What if all the accidents, all the bad decisions, all the pain and suffering from diseases and cancers could just be – skipped over? In a poignant story of love, life, and loss, Frank Peroretti crafts yet another page-turner of a novel. Dane and Mandy had the storybook romance; married at a young age, touring the world as a magician and beautiful assistant, taking the world by storm and loving every minute they shared together. Then a motor vehicle accident took Mandy from him, and Dane struggled to start over again. At a small coffee shop, Dane is mesmerized by the 19-year old beauty who is holding the audience spell-bound with her magic act. She is performing illusions that even he can’t understand. More disconcerting is the fact that her mannerisms, her quirks, her very persona is familiar . . . hauntingly so. How could this be? As Dane and his new protégé establish and begin to build a new professional relationship, the uneasiness grows. As does the danger. And for Dane, the climax will be more than he ever bargained for. Frank Peretti does a thorough job at explaining otherwise complex theories while keeping the reader firmly hooked with his masterful prose and winsome storytelling. 5 stars, 498 pages. $26.99 U.S.
Kirby Puckernut is an elf in Els Mere, which is near the North Pole. He makes toys for Christmas, and as Christmas nears, he comes up with a brilliant idea. Kirby quickly rushes off to see Santa, and Santa agrees it’s worth a try, so he sends Kirby to live with a family with a teenage girl who doesn’t believe in Christmas magic. Santa arranges to have Kirby sent special delivery and Kirby arrives. The children are fighting and the box gets knocked on the floor. Kirby is shaken up and scared, but not hurt. The family reads a note from Santa. The two younger children are excited to have their very own elf, but the teenager is very unhappy. She does something very mean and unkind and … is Christmas completely ruined? KIRBY PUCKERNUT AND THE CHRISTMAS SURPRISE is a fun Christmas story centered around Santa and his elves. The girls (ages ten and seven) loved the pictures, and I read the story to them, then my ten year old read it over again. My sixteen year old couldn’t resist sitting down to read the pictures too. The children all gave it five stars. I did enjoy the story, though it saddened me all the fighting that went on in the family, and I think the story was a bit long. I also didn’t like that it didn’t bring out the real meaning of Christmas in anyway. It was all about the more secular meaning of Christmas. And that saddened me. If you are looking for a great secular book about Christmas, then KIRBY PUCKERNUT AND THE CHRISTMAS SURPRISE is a treat. You and your kids will love it. And since my children gave it five stars – I will as well. Beautifully done in a hardbound book with a dust cover, perfect for gift giving. $17.95. 38 pages. Kirby Puckernut Facebook Page: ( http://www.facebook.com/#!/puckernut?fref=ts ) - we have some fun coloring contests coming up in December. 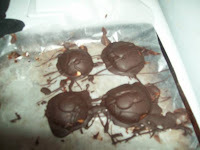 I love cookbooks, so when I got the opportunity to review THE AMISH FAMILY COOKBOOK, I jumped at it. This book is divided up into appetizers and beverages, breakfast foods, main dishes, grilling, vegetables and side dishes, and a whole lot of different sweets. 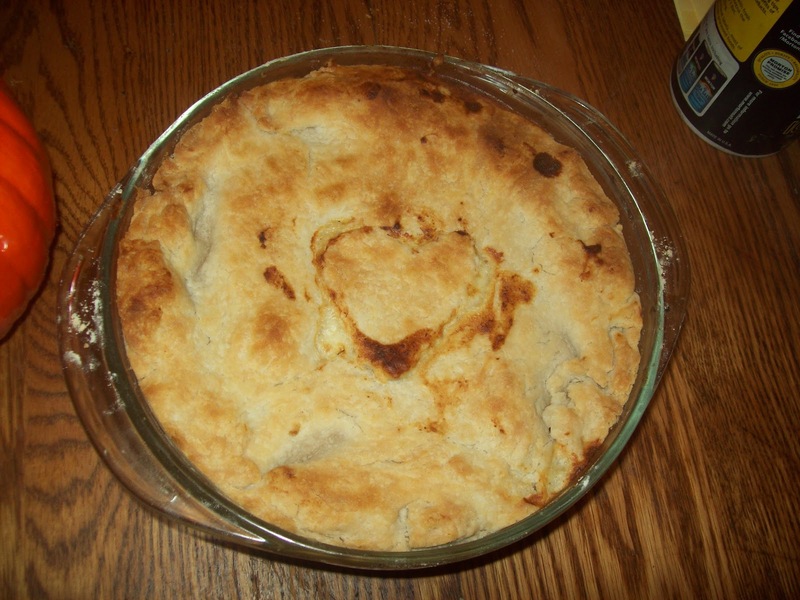 I tried three different recipes, baked oatmeal (which I didn’t take a picture of). 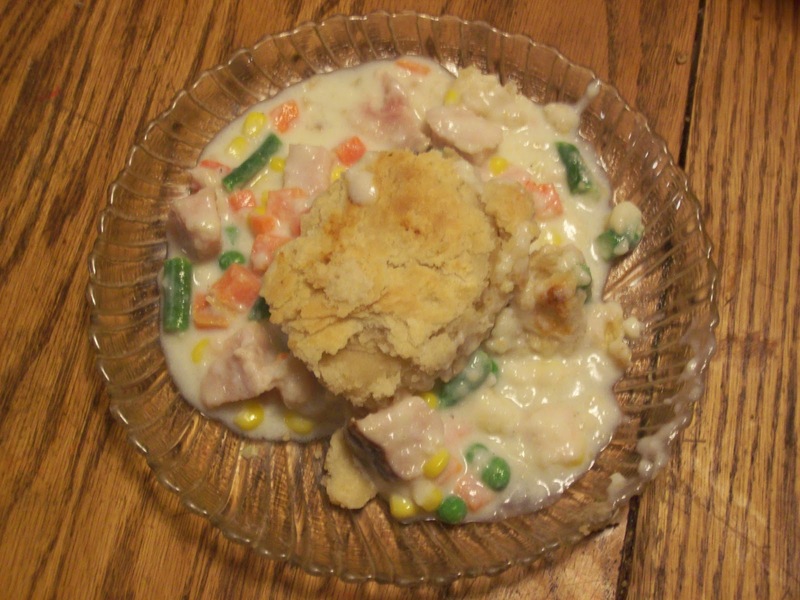 It was great and highly recommended, chicken potpie with some modifications. I added a lot of leftover mixed vegetables to mine, which it didn’t call for, and didn’t use heavy cream, but instead I made a white sauce for it. This is the chicken pot pie - both in the pie dish, and served. 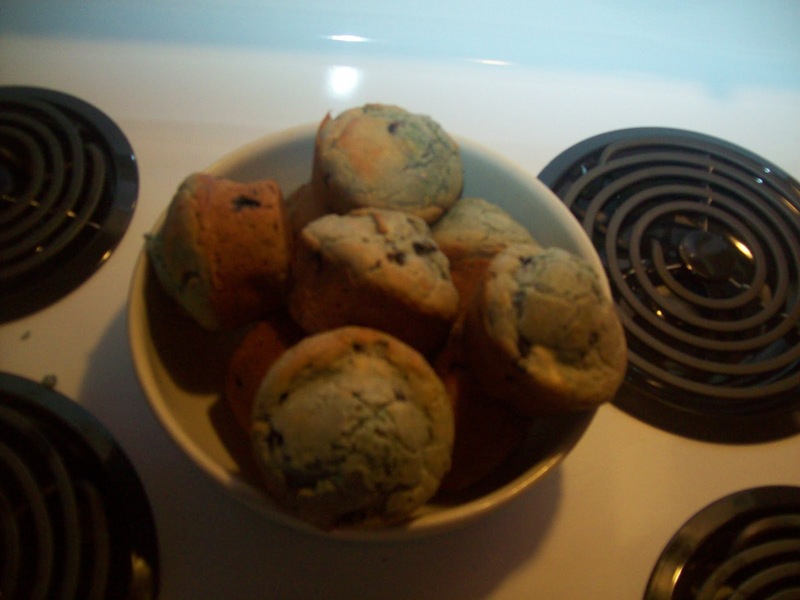 I also tried the blueberry muffins. They turned out great and made a quick lunch for a rushed day. Here are the muffins. My son made the peppermint patties, and they are absolutely wonderful. There are little side bars in the book that include jokes about the Amish and Amish proverbs which makes for interesting reading. If you love Amish cooking, are looking for a new cookbook or a cookbook for someone for Christmas or a gift of some sort, then THE AMISH FAMILY COOKBOOK would be great to consider! Highly recommend. It’s also spiral bound, which makes it easy to lay flat for baking/cooking ease. 260 pages. $14.99. IT’S THE MOST WONDERFUL TIME OF THE YEAR is chock full of absolutely gorgeous pictures of wintery and Christmassy things, quotations, lyrics of Christmas songs, ranging from the secular (Jingle Bells) to the religious (Joy to the World), poems, and sayings about Christmas. It is an absolutely beautiful hardcover book that would look great as a coffee table book and would be great to give as a gift to your secret sister or a co-worker, or someone whom you have no idea what to give them for Christmas. I especially enjoyed looking at the pictures more than anything. I would have loved to have the gospel message of our Savior’s birth included in this book, or at least bits of it, but it wasn’t. There are pictures of Mary, Joseph, and Baby Jesus though. A great little book. $12.99 hardcover. 48 pages. CHRISTMAS BLESSINGS is a sweet little hardcover gift book filled with adorable pictures of child angels. This book includes Bible references to our Savior’s birth, which I appreciated, along with inspirational Christmassy quotations, poems, thoughts, and snippets of songs. I enjoyed reading CHRISTMAS BLESSINGS and looking at the pictures. This book would make an adorable gift for your secret sister, a friend or co-worker, or someone whom you don’t know what to get for Christmas. This would make a cute coffee table book. Beautifully done. $12.99. 48 pages. Walking in Courage / Why Easter? Charlie is a tiny mouse. On his way to school one day, he is accosted by a bully who steals his lunch and pushes him into a mud puddle. Charlie is hurt and upset and he cries, but a kind, grandfatherly skunk helps him out of the mud puddle and helps him get cleaned up. Charlie determines to be kind to others, so when he sees the bullies attacking Angie skunk he is quick to step up to defend her. This gave Angie the courage to defend herself, and they became friends. But when Charlie and Angie see one of the bullies, Daniel, crying in a mud puddle, will they be kind to him? Or will they bully him in return? WALKING IN COURAGE is a cute little kid’s book. It has a great message about bullying and how kids should respond to it. A necessary lesson in this day and time. My girls (ages 10 and 7) read it through in a short time, and when I asked them what they thought of it they ranked it a 4 out of 5 stars because they expected Charlie’s dream to come true and instead that was kind of a part of the story that went no where. I recommend this book for elementary age students in public school. If a private or Christian school has this problem then it’d be good for them too. Homeschooled children, probably not so much, unless the neighborhood kids bully them. Beautiful illustrations. Rather pricy at $12.95. 24 pages. Easter is a celebration of the life, death, and resurrection of Jesus Christ. But how many children know why Jesus died and came to life again? 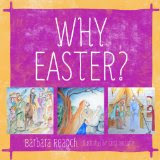 This illustrated devotional contains 28 lessons – one for each day of the four weeks leading up to Easter – in a short, focused format designed to help parents show the Christ of Easter to their children. Each devotionally is beautifully illustrated. It starts with a scripture reading for you to look up and read from the translation of your choice, then includes a recap of the story in story form for the child to listen to. It ends with discussion questions to make sure the children understand what they heard, so you can help them clear up any misunderstandings. A verse to memorize is included, as well as a discussion question for that verse, and a song to sing about Easter, and then a word or word phase to define and discuss. Christians will want to make sure that their children will understand what we really are celebrating on Easter (not just Spring, candy, and the Easter bunny) and their children will come to a clear understanding of why we celebrate. Recommended for church libraries, homeschoolers, Christian schools, and any other Christian house that has devotions with their children. Pricy at $14.95. 72 pages. Cara Hamilton has gone to New York City to be with her brother, one she’d presumed dead, until she received a letter from him. Eoghan said he’d meet her there, but if he’s delayed to talk to no one, trust no one. Curious at the strange instructions, Cara keeps them in her mind, but when a business man befriends her on the voyage, then directs her to someplace to stay, and alone and scared, she’s met by Rourke Walsh, who escorts her to the boarding house, Cara wonders. Both men seem nice. And as long as she doesn’t mention her brother, then it’s okay to make friends. Right? Rourke Walsh isn’t who he seems. His father was murdered by Eoghan Hamilton and he and his kin determine to avenge his death with Eoghan’s blood. They hope to track Eoghan down through his sister, Cara, and Rourke is assigned to trail her, just in case she is Eoghan’s sister. Eoghan knows Cara is in town. He’s tracked her to the boarding house the day she arrived, but she was with Rourke—his enemy. In hiding, Eoghan is forced to bide his time. But with Cara in town, and the enemy on his tail, is he safe? Is Cara safe? And can Eoghan save Cara from the truth about Rourke? 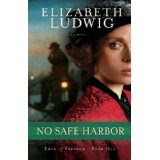 NO SAFE HARBOR is the newest romantic suspense from Ms. Ludwig. I enjoyed getting to know Cara, and Rourke, and even Eoghan. I wondered at what had happened to put Eoghan on the run, hiding, and why he worried about Cara’s friends, and I worried about Cara trusting so many so quickly when warned not to. Rourke is a dear, even though he was involved in scary business. I thoroughly enjoyed NO SAFE HARBOR and couldn’t read it fast enough. I was intrigued by all the secrets and the characters and had to read to find out what happens. If you are looking for a great romantic suspense, then NO SAFE HARBOR is definitely a book to consider. Perfect gift for the suspense reader on your list—or for yourself. $14.99. 336 pages. 5 stars. Elizabeth Ludwig is an award-winning author and an accomplished speaker and teacher. Her historical novelLove Finds You in Calico, California earned four stars from Romantic Times. She is the owner and editor of the popular literary blog The Borrowed Book. Along with her husband and two children, Elizabeth makes her home in Orange, Texas.